January is National Mentorship Month. Mentoring is an often-underappreciated aspect of being a good scientist. Scientists rarely receive training in it, yet are expected to lead younger colleagues through the sometimes-confusing path to becoming a scientist. Mentorship is especially important for minorities and people from underprivileged backgrounds for whom the world of “academia” can be completely unfamiliar. Without strong mentorship, these trainees may become discouraged and/or frustrated, potentially dropping out – or not even realizing the opportunities that are available in the first place (or how to access them). So, this #WiSEWednesday, we’d like to pay tribute to one of MANY great scientific mentors, biochemist Dr. Anita Corbett. Corbett earned an undergraduate degree in Chemistry from Colgate University and a PhD in Biochemistry from Vanderbilt University, then carried out postdoctoral training at Harvard Medical School. She joined Emory University in Atlanta, Georgia, as an assistant professor in 1997 (where she was the only female faculty member in the biochemistry department for over a decade). She remains a biochemistry professor there today, as well as co-directing the university’s MD/PhD program and serving as a member of Winship Cancer Institute’s Cancer Genetics and Epigenetics research program. Her research looks at how molecules move in and out of a membrane-bound intracellular compartment called the nucleus. The instructions for making molecular machines called proteins are written in the biochemical language of DNA and each protein has a DNA “recipe” called a gene stored in the nucleus. In order to make that protein, a copy of the gene has to be made (written in the similar RNA language) and taken out of the nucleus to the cell’s general interior (cytoplasm) to be made into protein. Corbett’s lab studies how the RNA intermediary undergoes this nuclear to cytoplasmic journey. Specifically, she looks at how RNA binding proteins aid (or inhibit) this process. Additionally, although proteins are made in the cytoplasm (because that’s where the protein-making machinery is) some proteins work in the nucleus, so they have to be imported into the nucleus. Corbett studies this direction of molecular transport (cytoplasm to nucleus) as well. She also looks at how problems with these processes are involved in diseases ranging from cancer, to neurological and neuromuscular diseases and how viruses can hijack a host cell’s transport machinery to get into and out of our nuclei. 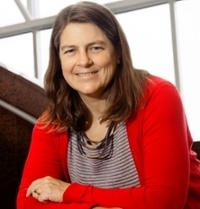 Corbett was the first recipient of Emory’s Eleanor Main Graduate Faculty Mentor Award and Nature journal recently awarded her a 2018 Nature mid-career achievement award for mentorship in science. In addition to mentoring students and colleagues, Corbett “mentors” her three children. She is also involved with Emory’s Initiative to Maximize Student Development (IMSD), which seeks to provide mentorship and opportunities to even the playing field for underrepresented students.